From the beginning, the He 111 was designed to fulfil the roles of both bomber and commercial aircraft. There were no basic structural differences between these two versions. Walter and Siegfried Gunter began work on the design of this all-metal low-wing monoplane in early 1934. The first prototype, the He 111 VI, appeared at the end of that year as an extremely clean-looking and efficient aeroplane. Powered by two 447kW 660-hp BMW VI liquid-cooled inverted-V engines, it was flown for the first time on February 24, 1935. It was equipped as a medium bomber, with provision for a 1000-kg (2200-lb) internal load of bombs (which were stowed upright), and had an armament of three 7.9-mm (0.311in) MG 15 machine-guns: one each in nose and dorsal positions and one in a retractable ventral 'dustbin'. The wings were of semi-elliptical planform, fitted with hydraulically operated trailing-edge flaps, the tailwheel-type retractable landing gear also being hydraulically actuated. Very clean in appearance, the prototype (in bomber configuration) was able to accommodate an internal bomb load of 1,000kg, and was armed with three machine-guns in nose, dorsal and ventral positions. Flight testing proved that its performance equalled or even bettered that of contemporary fighters. Of the new three prototypes, the V2 (D-ALIX) and V4 (D-AHAO) were built as commercial transports, with accommodation for ten passengers and a cargo of mail. Heinkel tried to interest Deutsche Lufthansa in the He 111 as a commercial transport, and the idea that it was purely a civil type was fostered by the German government even after the existence of the military version officially became known in January 1936. The second prototype was completed as a civil transport and was handed over to Luft-Hansa following the termination of early testing. Subsequently, this aircraft reverted to being used by the Luftwaffe for secret high-altitude reconnaissance missions. Many such missions were flown prior to the outbreak of World War II, both by military and civil aircraft, so that long before wartime operational missions were flown, the Luftwaffe had acquired very detailed documentation of a vast number of important targets. The fourth prototype, with accommodation for ten passengers in two cabins, named Dresden, was delivered to Luft-Hansa on 10 January 1936. Six production airliners, He 111C named Breslau, Karlsruhe, Koln, Konigsberg, Leipzig, and Numberg, entered service from the summer of 1936. Lufthansa did in fact operate small numbers of the He 111C and He 111G, but not until some time later. The V3 (D-ALES) was the prototype for the first military version, and ten pre-production He IIIA-0s were con-structed towards the end of 1935 and delivered to the Rechlin test centre of the Luftwaffe during the spring of 1936. It inherited the elegant lines of its single-engined forebear, the He 70, and had generally good handling characteristics, but the BMW engined He 111 was found to be insufficiently powerful for military use. The Luftwaffe therefore rejected the similarly-powered He IIIA-Is that had been completed, and the pre-production A-0 machines were sold to China. The He 111A initial bomber variant was underpowered and lacked adequate performance, but this was rectified in the He 111B series by a switch from the 492-kW (660-hp) BMW 6,0Z to the Daimler-Benz DB 600, which not only boosted performance but also permitted the carriage of a heavier warload. The type was soon slated for evaluation with Kampfgruppe 88 of the Legion Condor, and from February 1937 some 30 He 111B-1/2s were despatched for service with two of KG/88s three Steffeln. Production of He 111 bombers continued with the He 11IE, although this had been preceded by the second major civil variant, the He 111G. This latter model did not attract many customers, but it was noteworthy in having introduced a redesigned wing with straight taper, which was easier to produce than the semi-elliptical shape that characterized the previous models. The He IIIE retained the original wing form, but introduced another basic change - the adoption of the Junkers Jumo 211 engine (in this series the 1010-hp Jumo 211A-1) in order to preserve supplies of the DB 600 for fighter production. Sub-types of the E series included the E-1, with 2000-kg (4410-lb) internal bombload; the E-3, similar except for equipment changes; and the most numerous E model, the E-4, which could carry 1000 kg (2200 lb) internally and equal load externally; and the E-5, with additional fuel tanks. The type proved very successful in operational and maintenance terms, and from March 1938 some 45 He 111 E-1 s with a heavier warload were despatched for service with KG/88s four Staffeln, the He 111B-1/2s being passed to the Nationalists 10- and 11-G-25. At the end of the war the 58 surviving He 111s were given to Spain. The 'straight' wing was combined with the slightly more powerful 1100-hp Jumo 211A-3 to produce the He 111F, the prototype of which appeared in mid-1937. He 111Es also served in Spain and the combined total of Bs and Es sent to Spain was 75, of which 58 survived the civil war to form a part of the reconstituted Spanish air force. The main Luftwaffe F model was the He 111F-4. Exports at this time included 24 He 111F-Is and five He 111G-5s to the Turkish air force. 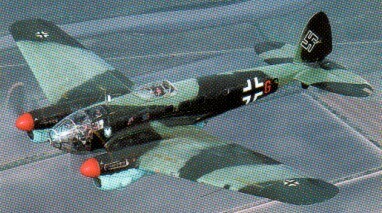 One other Luftwafte variant with DB 600 engines was the He 111 J (with DB 600CGs), about 90 of which were completed. They were otherwise generally similar to the F-4, except that their bomb bays were deleted as they were intended for use as torpedo-bombers though they were, in fact, delivered for service on standard bombing duties. The next major design change, one which gave the He 111 a new look, occurred in the He 111P, which began to enter service during the early part of 1939. This took the form of a complete redesign of the fuselage nose, eliminating the conven-tional 'step' created by the pilots' flight-deck windows in favour of an extensively glazed forward section which maintained the flow of the fuselage lines unbroken above and below the nose. At the tip of this new nose, and offset to starboard, was a ball-type universal mounting for the nose machine-gun. The P series comprised the P-1 and P-2, which differed only in their radio equipment; the P-3, a conversion for dual-control training; and the P-4 and P-6. Overall He 111 P production, shared by Arado, Dornier and Heinkel, was in the region of 400 aircraft. Early models had 1100-hp DB601A engines, three defen-sive machine-guns, and the standard 2000-kg (4410-1b) bombload carried half internally and half externally. Need for better defence was reflected in the armour protection of the P-4 and P-6, the former also mounting up to six MG 15 machine-guns (and, sometimes, an MG 17 in the tail). The P-6 (there was no P-5 built) was similar to the P-4 except for 1175-hp DB 60IN engines - ten of this model were supplied in 1942 to the Hungarian air force. Like other earlier models, however, the He 111P was drawing upon supplies of engines more urgently needed for fighter production, and so relatively few of this series were built. The next model to enter production, and the most numerous of all, was the He 111 H. This combined the airframe of the early P models with the Jumo 211 powerplant. By the time He 111 production was phased out in the autumn of 1944 well over 7000 had been turned out, of which more than 6000 were sub-types of the H series. Power plant of the He 111H comprised two Junkers Jumo engines, with power ranging from 752.6kW for the Jumo 221A to 1,323.5kW in the Jumo 213A-1 installed in the final production He 111H-23 paratroop carrier. Production of the He 111 had reached almost 1000 by the start of the Second World War, at which time 349 of those in Luftwaffe service were He 111Ps and 400 were He 111Hs of one model or another. It did not take long to destroy the illusion of security created by their easy passage during the Spanish Civil War. After experience of rough handling by the RAF's Hurricanes and Spitfires during the Battle of Britain, moves were soon under way to increase the bomber's defensive armament. This began with the addition of two 7.9-mm (0.311in) beam guns on the He 111 H-2; other typical variations in armament included the provision of a 20-mm (0.79-in) MG FF cannon in the under-nose gondola of some H-3s, for anti-shipping attacks (Up to 2000 kg (4410 1b) of bombs could be accommodated); a combination of one MG FF, one 7.9-mm (0.311-in) MG 17, and either one 13-mm (0.51-in) MG 131 or two 7.9-mm (0.311-in) MG 81 guns on the H-10; and four MG 81s and three MG 131s on the He 111 H-20. In all, there were 23 sub-types of the H series, of which the most numerous models were the H-3, H-6 and H-16. Most H sub-types were powered by successive versions of the Jumo 211 engine, although the H-21 had 1750-hp Jumo 213Es and the H-23 was fitted with 1776-hp Jumo 213As. With such numbers available, it was inevitable that the He 111 should be called upon to undertake a wide variety of duties in addition to the standard bombing role. The H-3 and H-6 became excellent anti-shipping aircraft, the latter becoming operational in the spring of 1942 and being able to carry bombs or mines internally and two externally-slung torpedoes. A large fender to cut through or push aside the cables of barrage balloons was fitted to the He 111H-8. The H-10 and H-18 were night bombers; the H-12 was adapted as a carrier for a pair of Henschel Hs 293 glider-bombs; the H-14 served both as a pathfinder bomber and a glider tug; the H-15 was a carrier aircraft for Blohm und Voss glider-bombs; the H-22 was the version adapted as air-launch aircraft for Fieseler Fi 103 (V1) flying bombs; and the final model, the He 111 H-23, was an assault or saboteur transport carrying eight paratroops. 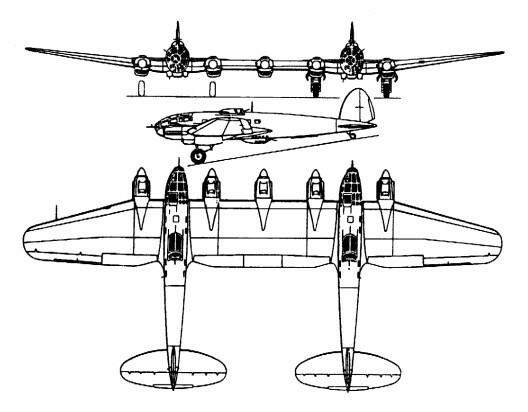 The Heinkel He 111 Zwilling (Twin) consisted of two Heinkel He 111H-6 twin-engined medium bombers joined together. Created by 'marrying' two standard He 111H-6s or -16s by connecting them with a new wing centre section which mounted a fifth Jumo 211F-2 engine. This strange improvization came about through the need to develop a towing aircraft large enough to be compatible with the Messerschmitt Me 321 Gigant troop glider. The He 111Z was evolved during 1941-42 and carried a crew of seven. Piloted from the port fuselage, it performed its task well, but its role disappeared when the Me 323 self-powered version of the Gigant replaced the Me 321. First flown in Spring 1941, two prototypes and 10 He 111Z-1 production aircraft were built. For takeoff, 2 Jato rockets of 500 Kgp were under each fuselage and 2 of 1500 kg under the central wing. The adoption by the Spanish air force of those He 111Bs and Es which survived the civil war led, in 1941, to the Spanish government acquiring a licence to manufacture the later H-16 model at the CASA factory in Tablada, near Seville. Two hundred were ordered initially, but only 130 of these could be completed owing to the shortage in supply from Germany of the Jumo 211F engines to power them. Armed with a mixture of German and Italian guns (single MG 15s in the ventral gondola and in the rear of the crew cabin, and a 12.7-mm (0.5-in) Breda-SAFAT in the nose blister) they were designated B.2H by the Spanish air force. Manufacturer's designations divided them into C-2111A (bomber models), C-2111C (reconnaissance-bombers, with cameras in the starboard half of the bomb bay), and C-2111F (dual-control bombing trainers). When the supply of Jumo engines ran out the eventual choice of a replacement fell upon the Rolls-Royce Merlin Mk 500 and 173 examples of this engine were purchased from Britain. These were used both to power additional CASA-built aircraft (C-2111B bombers and C-2111D reconnaissance bombers, the latter having 1610-hp Merlins), and also to re-engine some of the earlier Jumo-powered Heinkels. Spanish air force designation for all Merlin powered examples was B. 21; later, Jumo and Merlin powered bombers were included in 15 aircraft converted to T.8 (CASA C-2111E) nine-passenger troop transports. The C-2111 series continued in Spanish air force service until the end of the 1960s. A total of around 7500 were built, including licence production in Romania and Spain (as the CASA 2111). 263 licence built Heinkel 111s were built by CASA as the 2111 as late as 1956. 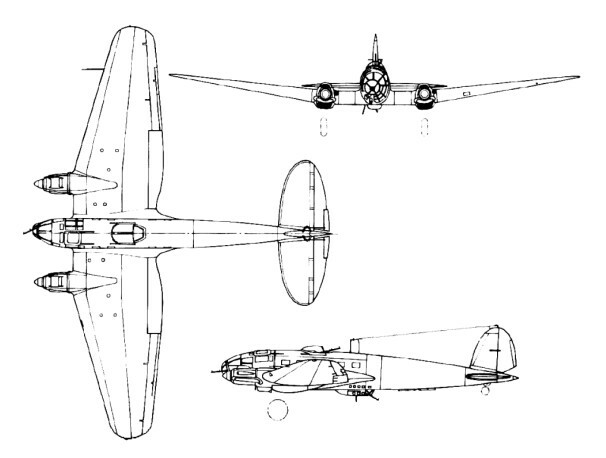 Engines: 2 x 1,200 hp Junkers Jurno 211 D.
Armament: 1 x 20 mm cannon 6 x 7.9 mm machine-guns. Max speed: 267 m.p.h. (430 kph). Range: 2,175 miles (3,500 km.). Length: 17.5m (57 ft 5in). Armament: 3 x 7.92-mm (0.312-in) mg, up to 1500 kg (3,307 lb) of bombs internally. Max T/O weight: 10000 kg (22,046 lb). Max speed: 230mph at 13,125 ft. Maximum speed: 420 km/h (260 mph). Height: 14 ft 7.25 in (4.4 m). Engines: 2 x Junkers Jumo, 1000hp. Max TO wt: 21,168 lb (9600 kg). Engines: 2 x Junkers Jumo 211 F-2, 1340 hp. Maximum speed: 405 km/h (252 mph). Maximum speed: 320 km/h (200 mph). Engine: 2 x RR Merlin, 1610 hp.